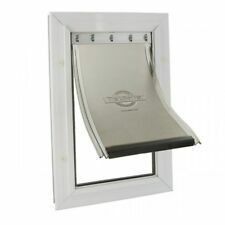 PetSafe Staywell Aluminium Pet Door Large - Strong Dog Flap 640ML This door gives your pet all the independence he needs. 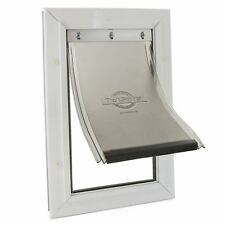 Easy to install, the solid aluminum frame has reinforced corners for heavy use or for multiple pet homes. The flexible, soft flap is tinted and adjustable. A magnetic flap closure and pile weather stripping along the sides of the flap opening form a weather-resistant seal. A closing panel is included for improved weather-resistance or to control your pet’s access to the pet door. PetSafe Staywell Aluminium Pet Door Small, White 600ML - Dog & Cat Door Flap Description This door gives your pet all the independence he needs. Easy to install, the solid aluminum frame has reinforced corners for heavy use or for multiple pet homes. The flexible, soft flap is tinted and adjustable. A magnetic flap closure and pile weather stripping along the sides of the flap opening form a weather-resistant seal. A closing panel is included for improved weather-resistance or to control your pet’s access to the pet door. WARNING: Small children can pass through door. PetSafe® Staywell® Aluminium Pet Door – Extra Large. This door gives your pet all the freedom he needs. Made from aluminium. Flap size: 34.9 x 60.3 cm (W x H). Suitable for extra large sized dogs. Cut-out size: 36.6 x 64.2 cm (W x H). 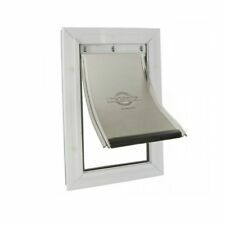 1 X PetSafe Staywell Aluminium Pet Door. With a soft, flexible flap, cats and dogs can push the door open with ease, allowing them to explore without supervision. A magnetic flap closure and pile weather stripping along the sides of the flap opening form a weather-resistant seal. PETSAFE STAYWELL MEDIUM ALUMINIUM White finished Aluminium with hard wearing flexible Flap. Barrier Locking System. Easily fits Solid Core Doors, Hollow Core Doors, Irregular Surfaced Doors, Storm Doors & Recessed Doors. Fits doors 1"-2" thick, if fitting in thinner doors you will need competent DIY skills to cut the aluminium tunnel down to size. If fitting in thicker walls or doors you would need to look at making you own tunnel to line the cut-out hole. Suitable for dogs up to 18kg (40lbs), e.g, Beagles, Cocker Spaniels, Terriers, Shetland Sheepdogs, Miniature Schnauzers. Overall size: 400mm x 277.6mm (15 ¾" x 10 15/16") Cut out size: 348mm x 225mm (13 ¾" x 8 7/8") Maximum pet shoulder width: 209mm (8 ¼") Maximum pet weight: 18 kg (40 lbs). 1 x Staywell Aluminium Pet Door, Large, White. With a soft, flexible flap, cats and dogs can push the door open with ease, allowing them to explore without supervision. A magnetic flap closure and pile weather stripping along the sides of the flap opening form a weather-resistant seal. 1 x Staywell Aluminium Pet Door, Small, White. With a soft, flexible flap, cats and dogs can push the door open with ease, allowing them to explore without supervision. 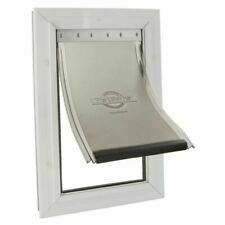 A magnetic flap closure and pile weather stripping along the sides of the flap opening form a weather-resistant seal. Ensuring that your house stays warm. White finished heavy duty Aluminium with flexible flap. Locking Security barrier. Suitable for all doors up to max 2" (50mm). Easy to maintain, clean and operate, the pet door also includes a closing panel for when it is not in use or you want to keep your pet in. This provides pets with a greater freedom of choice end extends the areas in which they can self-exercise and explore. Wicklow - Staywell® Aluminium Pet Door - Small White. Easy to maintain, clean and operate, the pet door also includes a closing panel for when it is not in use or you want to keep your inside. Maximum pet shoulder width: 132 mm (53?. ). The Staywell Aluminium Pet Door is perfect if your large sized dog is boisterous and would pose a risk to damaging other alternatives on the market. It is hard-wearing and flexible and features a barrier locking system to ensure that you can keep you pet inside when you would like to. PetSafe Wall Entry Pet Door Convenience for you and your pet The PetSafe Wall Entry Pet Door allows you to install your new pet door into an interior or exterior wall instead of a people door. Condition is New.